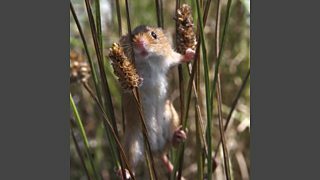 BBC One - Planet Earth II, Grasslands, In pictures... - A female harvest mouse climbs through grass blades. A look at survival in grasslands, from Asia's saiga antelope to the anteaters of Brazil. A female harvest mouse climbs through grass blades. 5/6 A look at survival in grasslands, from Asia's saiga antelope to the anteaters of Brazil.